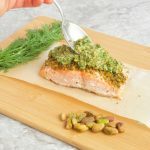 Pistachio Crusted Salmon with Citrus Gremolata – An easy and healthy dinner recipe for crispy baked salmon topped with a fresh herb and citrus gremolata sauce. Line a baking sheet with parchment paper, and add salmon fillet. Set aside. Combine remaining ingredients for salmon in bowl of a food processor. Pulse until mixture is a fine crumb. Transfer to a small bowl, and press onto top of salmon filet evenly. Bake in preheated oven for 8-12 minutes, or until flesh is firm and flaky. To make gremolata, combine remaining ingredients in bowl of a food processor. Pulse until combined, but not pureed. Cut salmon fillet into 3-4 servings, and top with gremolata sauce. I buy and cook my salmon with the skin still on since it adds more flavor and moisture without drying out. It can easily be removed before or during eating, or even eaten if you’re up for it! Parchment paper makes for super easy clean-up and prevents the fish from sticking, but aluminum foil will work as well. If using parchment, spray the baking sheet lightly with oil first. This helps to keep the parchment paper in place. Use the gremolata to top other foods such as baked potatoes, green beans, or even toast!